Stems: Erect, stout, simple or sometimes slightly branched above, glabrous, waxy. Leaves: Opposite, simple, mostly sessile, ascending to spreading, thick, broadly ovate to oblong, 2.5 to 6 inches long, 1 to 3.5 wide, glabrous; margins entire; tips blunt to rounded, usually bearing a short point. Inflorescences: Umbels, 1 to several, in upper leaf axils, 15-40-flowered, stalks .5 to 3 inches long. Flowers: 5-parted, .6 to .8 inch tall; stalks slender, 1 to 1.5 inch long; sepals 5, lanceolate to ovate, green to purplish or pinkish, glabrous; corolla lobes 5, pinkish rose to rose-purple, glabrous, bent abruptly downward; hoods somewhat fleshy, ovate-oblong, attached near bases, spreading; horns sickle-shaped, in-curved, fused to lower half of hoods. Fruits: Pods, spindle-shaped, 3 to 4 inches long, about 1 inch wide, finely hairy or glabrous, erect or ascending on downward-curved stalks; seeds many, compressed, tufted with silky white hairs at tips. Habitat: Moist lowland prairies and roadsides, most abundant on limestone soils. Comments: Smooth milkweed tends to occur in colonies. It is named after William Sterling Sullivant, 1803-1873, an authority on mosses. Formerly treated as Asclepiadaceae - Milkweed Family. 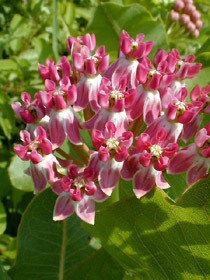 The flowers are showier than those of common milkweed (Asclepias syriaca L.), which has pubescence on the stem and leaves.